Ballinamallard winger Jay McCartney wants his side to kick-start their European dream this weekend. The quest for a qualification spot hasn’t exactly gone to plan so far. Just a point from their opening five league matches, they’re above only Portadown in the table. Granted, two missed penalties late in their last two league fixtures have cost them four points, but it’s far from ideal. The Mallards host Coleraine at Ferney Park on Saturday and Sligo man McCartney hopes this could be the start of their Premiership revival. New boss Gavin Dykes did pick up his first win on Tuesday night. McCartney’s bullet of a half-volley helped them to a 3-0 success over Dundela in the League Cup. Now that has to transfer into league form. “It’s great to get that first win to build our confidence up, particularly the young lads in the team,” said McCartney. The Mallards have only lost to Coleraine once in seven meetings at Ferney Park since the Fermagah side’s promotion back in 2012. That’s a record McCartney is keen to protect as he eyes up a positive season under new boss Gavin Dykes. “We dont want to be fighting relegation,” he said. “We’re looking at seventh and a European play-off spot. Clubs at the top might not like the European play-off system as much but it keeps the league entertaining and keeps teams fighting to the end. The Bannsiders are in ninth spot, four points above Ballinamallard. They got their first league win with their thumping 4-0 success over Glentoran last Friday and followed it up by beating Limavady 3-0 in the League Cup. 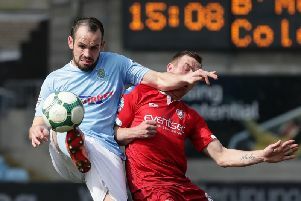 “There’s probably been an air of frustration about the start of the season from our point of view as we have put in some good performances but we haven’t got what we have deserved out of the games,” said boss Oran Kearney. “Friday night was just brilliant, there’s no other way to descirbe it. I can praise all 14 players who played, they were all on the money. “We followed it up with a professional performance against Limavady in the League Cup. “We’ve shown what we can do, and that’s the frustrating side for me as we have to produce that more consistently. We have set the bar now and we have to aim for that every week. Ballinamallard’s Jonny Lafferty made his return from a knee injury, coming off the bench in Tuesday evening’s success. He will come into the squad for Saturday’s match.